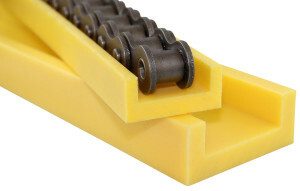 Redco™ UHMW Channel (U-Channel) reduces chain or belt wear by reducing friction. Unlike metal-to-metal contact, because of UHMW’s very low coefficient of friction and self-lubricating properties, metal chain glides along the plastic channel with extremely reduced abrasion. Replacing steel channel with plastic channel also reduces power consumption and saves premature replacement costs of both the chain and equipment. View Standard Profiles. Fight friction and reduce costs with long-wearing Redco™ UHMW Belt and Chain Channel. Redwood Plastics carries many standard profiles in-stock with custom extrusions available. Standard UHMW Channel is available in yellow (orange is some locations). Several high performance grades of UHMW plastic are also available including Titanium (longer wearing), and Synsteel (pulp-safe) as well as wear beds and wear strips. Plug welding, standard fastening hardware, and tools are available. Please inquire. Less wear on your chain, less noise and less maintenance costs without having to change out your metal channel. These inserts simply fit into your current channel. Available in C3 and C4 profiles and compatible with 81x, 81xH and H78 chain. Absorbs impact to extend equipment life and conveyor life cycles. Redco Dissipater Channel can withstand heavy impacts from tall heights and stop the crystallization of welds and the crumbling of concrete. Extends the chain life, lowers operating temperatures, lowers operating noise decibel levels, and reduces lubrication costs on high speed roller chain and sharp top chain applications.